• conversion tables, measurements, and much more! In Camus, (pronounced “chum-us”) First Nations elders and families from the west coast of Vancouver Island and northern Washington share the wisdom and riches of their territories. 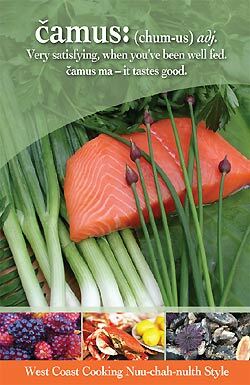 Marrying community cuisine with cooking tips, cultural observations, and oral history anecdotes, Camus features traditional and modern ingredients for a mouthwatering read. Instructions about the traditional preparation of Vancouver Island’s wild foods, including fish, kelp, berries, and fowl are interspersed with recipes for the modern kitchen. Bringing together the wisdom of the elders with the culinary artistry of B.C.’s tastes, Camus explores the art of how to butterfly a salmon, how to can fish, as well as recipes for marinated seaweed, steam pit cooking, Nuu-chah-nulth upskwee, and shellfish. Wholeheartedly endorsed by the Nuu-chah-nulth Council of Ha’wiih (hereditary chiefs), Camus illuminates a traditional way of eating while promoting a healthy lifestyle.